According to eMarketer’s newest forecast, online video ad spending in the U.S. will reach $27.8 billion. Accordingly, it will constitute one quarter of all U.S. digital advertising in 2018. Facebook (and Instragram) — $6.81 billion. Facebook has nearly 25 percent of the 25 percent. The eMarketer forecast predicts that Facebook (and Instagram) will have 24.5 percent of all US video ad spending this year or $6.81 billion, as indicated. Facebook controls nearly 90 percent (87 percent) of video ad spending on social media sites in the U.S. YouTube is not considered a social media site by eMarketer. EMarketer says that 60 percent of Snapchat U.S. ad revenue now comes from video. 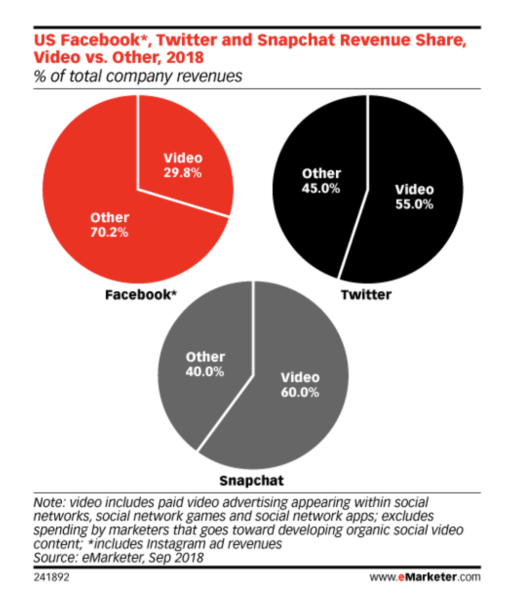 Twitter will see nearly the same portion of its ad revenue (55 percent) from video; however Twitter has only a 2.3 percent share of total video spending according to the forecast. Focus on net not gross YouTube revenue. The forecast may at first glance be confusing. YouTube has been a continuing driver of Google ad revenue growth and it seems strange that Facebook has roughly twice the video ad revenue. EMarketer says that “YouTube will generate $3.36 billion in net U.S. video ad revenues” in 2018, while Facebook approaches $7 billion. However eMarketer is focused on net rather than gross ad revenue. YouTube has higher costs than other video sites and likely pays a significant portion of revenue out as traffic acquisition costs. Alphabet has never reported YouTube revenue as a separate category, although a number of analysts believe it will start to do that in the near future. In terms of gross revenues, YouTube would probably be considerably larger than Facebook. Some on Wall Street have suggested that YouTube total ad revenues could be as high as $15 billion. Why it matters to marketers. Video has always been a preferred ad medium for brands. The growth of digital video ads reflects both their effectiveness and the consumer shift away from linear (traditional) TV as cord cutters and younger audiences spend more time with OTT services.